Private appointments: Epworth Hospital Richmond (Director of Robotic Surgery), Cabrini Hospital Malvern and Brighton, and Masada Private Hospital East St Kilda. Public appointments: The Royal Melbourne Hospital Parkville, and Peter MacCallum Cancer Centre. Daniel Moon is a urologist with particular expertise in laparoscopic and robotic surgery, the management of prostate cancer and the aftermath of its treatment. 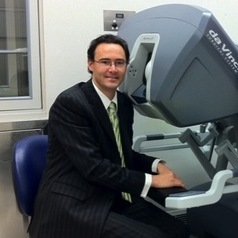 He has performed over 800 major laparoscopic +/- robotic procedures, published the first Australian series of laparoscopic radical prostatectomy in 2008, performed the first Australian robotic cysto-prostatectomy in 2009, assisted in the implementation of robotic surgery at Cabrini Hospital, and has established a robotic partial nephrectomy program at Peter MacCallum Cancer Centre. He convenes the biennial National Kidney and Bladder Cancer Symposium and held Australia’s first robotic prostatectomy surgical masterclass in 2011. Mr Moon has also developed a high volume urological prosthetics practice, restoring continence and potency in men following prostate cancer treatment. In addition to regular involvement in local and international meetings and workshops, he has co-authored the first multicentre Australian series of suburethral male slings, presented in 2012.